Carol Welsman is the beautiful, blonde and altogether superb Canadian jazz singer/pianist who is NOT Diana Krall. She calls this disc [ALONE TOGETHER] her “truest to the jazz art form to date” which, aside from the odd formality of the locution, is inarguable. That’s the kind of thing that will happen when your band is composed of trumpet player Wallace Roney, bassist Rufus Reid, drummer Lewis Nash and guitarist Jay Azzolina. She has her own way around a standard and always has. Her singing won’t remind you of anyone, unlike Krall who sometimes sounds like Joni Mitchell and sometimes sounds like Julie London.) She performs jazz musician favorites like It Might As Well Be Spring, My Ship and the freely conceived title tune, one of the most traditional of “jazz naturals” in the American Song Book. But outside that repertoire she is equally good too. And when she scats, she does it with lusty authority. Three and a half stars. Carol recently chatted with CP24’s Stephen LeDrew about her new release, Alone Together. Check out the interview here. Raised in a musical family in Toronto, Ms. Welsman has been a musician and singer since she was a child. After spending several years in Europe, she returned to Canada where her jazz career took off. A six-time Juno nominee and winner of Berklee College of Music’s Distinguished Alumni Award, the multi-lingual Ms. Welsman has just released her 11th album, Alone Together. “I had such a great experience. Classes had a maximum of 20 students. In Grade 7, we read Homer’s The Odyssey and The Iliad. The subject matter was so advanced. The demands on excellence were very high. There was a lot of peer pressure. You had to test into school. In the beginning, I really struggled, but I soon caught up. “There was a great sense of camaraderie, a sense of togetherness that I never felt at another school. There was a team effort, team spirit for everything. It stays with you for life. As a cool September breeze pushes the mists of summer down the bay, ushering in a new season, Carol Welsman’s Alone Together — to be released Friday, Sept. 18 — freshens some old songs you know and some you may not have ever heard. And how good is that? Good enough that Sammy Cahn is featured twice, opening the album with the classic “Day By Day,” with Wallace Roney’s trumpet floating under and around Carol’s vocal, and later with “You Taught My Heart to Sing,” music by McCoy Tyner. Carol would win on great taste if nothing else. But there’s a lot else. Throughout Carol sings lead with both her vocal crystal clarity and her interwoven piano work. On another classic, “It Might as Well by Spring,” her stylish singing and piano share a love affair with a song. Balanced by the delicate strength of Jay Azzolina’s guitar solo. Then here comes a song I didn’t know, “Sand in My Shoes,” a timely ode to Havana’s lure. Yeah, I don’t like the Castros but I’d sure like to see what’s left of Hemingway’s Boat. The title song has an a cappella intro which makes me wonder how terrific it would be if she sang the whole song that way but, hey, who could object to her piano here with the terrific rhythm section of Rufus Reid on bass and Lewis Nash on drums. They’re good everywhere on the album. “My Ship” is my favorite cut on the album, if anyone wants to know. I know. I have a weakness for Kurt Weill and Ira Gershwin but we all have our prejudices. Carol’s control of Weill’s so yearning self doubting lyrics is right on point. Pinpoint control in all places is one of the most notable qualities of her singing and piano playing throughout the album. It’s a great strength but as an old merchant I knew once said: “What makes you strong can be your weakness sometimes.” The whole album seems so controlled, so measured, so skillfully managed, that I sometimes wish for a ragged edge, a few moments of abandon, a little feeling of improvisation. This is essentially a jazz album after all. Perhaps it’s Carol’s classical background that requires her to measure each note, each chord, each turn of phrase. European jazz often has that feel and just once in a while wouldn’t you like the conductor to leave the stage and just let the guys play? But her strength is precise playing, sound arrangements, perfect song selection and, in the end, poignant emotion. “Killing Time” brings an absolutely aching conclusion to the album. If you could hear tears, you would hear them in the spaces between the notes. Deen and her partner, Louis van Amstel, danced to Hey, Good Lookin’ by Carol Welsman, a song that afforded them the opportunity to have Deen stand in a kitchen during the line “whatcha got cookin’?” No major disasters but the judges said she seemed scared, an observation Deen agreed with no less than five times. 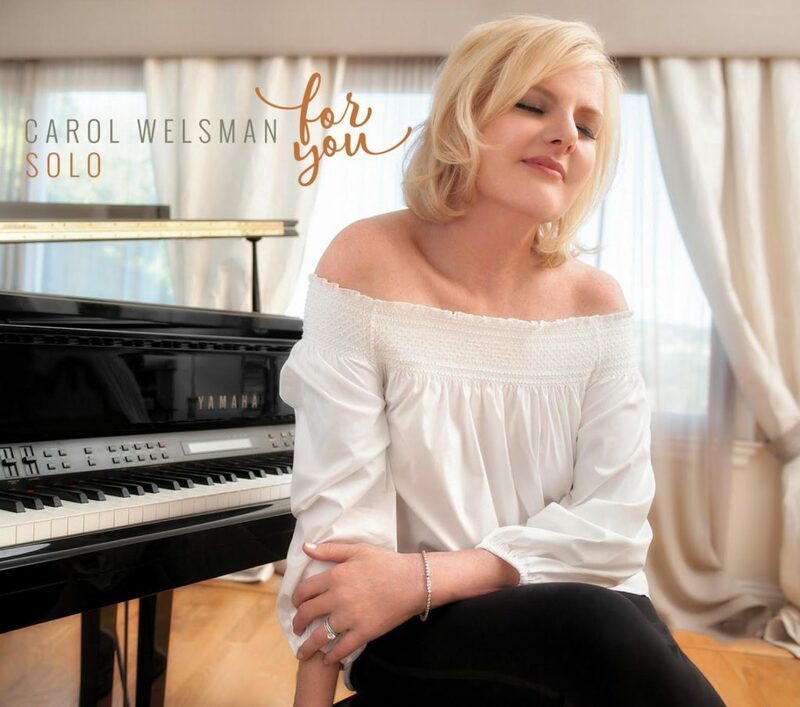 Vocalist/pianist CAROL WELSMAN has a new album, Alone Together, which she calls, “my truest to the jazz form to date.” It is an impressive eleven-song outing with the sublime support of Wallace Roney on trumpet, Jay Azzolina on guitar, Rufus Reid on bass and Lewis Nash on drums. Welsman is a creative singer with a rich vocal instrument, and she also plays terrific piano. When it comes to choosing tunes, her taste is as hip as her choice of musicians. The program starts with five standards, Day by Day, It Might As Well Be Spring, Sand in My Shoes, My Ship and Alone Together, each a fine song that has not been overdone. Welsman adds her own twists to each, making them sound fresh and special. Things then become a bit more esoteric. Disappointed has lyrics that Eddie Jefferson set to part of a solo by Charlie Parker on Lady Be Good. If the Moon Turns Green is one of those tunes that acts like a magnet for good jazz singers. You Taught My Heart to Sing is the result of an unlikely collaboration between McCoy Tyner and Sammy Cahn. Joe Derise was among the hippest of singer/pianists, and he concocted the wonderful The Blues Are out of Town with lyricist Marcia Hillman, a song deserving of more than the few recordings that it has had to date. It is always a pleasure to hear the Duke Ellington/Bob Russell gem, I Didn’t Know About You. The last selection is by Jule Styne and Carolyn Leigh, Killing Time, ironically Leigh’s last lyric. Put all of this together, and you have a vocal album that is bound to make a lot of year-end lists of favorite albums. Early reviews have cited ALONE TOGETHER as the album that will cement Welsman’s ascendancy to the upper levels of the contemporary jazz vocal world. DON HECKMAN – International Review of Music Download the full review HERE.